Please save the date March 30, 2019. Tickets: Advanced purchase required. Reservation form. Cost: $18 per person or $130 for a table of eight. Attn: WOA Nominations (or) Breakfast Ceremony R.S.V.P. Dardinella Bacon Hippchen has been at work in Muskegon County schools, churches, private industry, and as an entrepreneur for over 50 years. She has used her knowledge and talent to engage youth and young adults in all aspects of leadership and development to ensure access to academic and career experiences and growth in their learning environment. Dollie works in her Nelson Neighborhood Association to revitalize the neighborhood through parks, safety, and beauty. She is a member of Master Gardener, the state Restorative Justice Program, the Salvation Army, and is an AmeriCorp volunteer. In addition she founded the Black Women’s Political Caucus, was a member of the former Urban League of Greater Muskegon, and is presently a member of the Muskegon branch NAACP and Chair of the Scholarship Committee. With a mission and goal of enhancing and broadening the quality of life of women, children, and families in Muskegon County, Ms. Hippchen is a fine example of what it means to be a Woman of Accomplishment. Holly Hughes – If you have been out in public anywhere in Muskegon County in the past 30+ years, you’ve seen Holly. She is active on the Muskegon Promise Zone board, the Senior Resource board, Early Childhood Thrive foundation, the Community Foundation for Muskegon County, Tanglewood Park Project for Seniors, the White Lake Recyclers, LST 393, the Veterans Museum board, the West Shore Symphony, and others. Holly champions children with reading programs in cities in Muskegon County. She has been a driving force in raising money for the Muskegon Girls and Boys Club and is currently in process of raising $2.5 million for the Muskegon Promise. In addition to all that, Holly was instrumental in organizing the Veterans Flight of Heroes to Washington, D.C. and the Veteran’s Job Fair, an annual Muskegon event. As a State Representative, Holly used her position to mentor and act as a role model for many students. She gave personal tours of the state capital and granted Legislator of the Day status to students who won summer reading programs. Her time as a legislator saw the introduction of a variety of bills that became laws that increased safety and health especially for women and girls in our state. In addition, Holly is always ready with a listening ear – no matter how busy she was. She worked to make everyone feel that they had a friend in government and yet wasn’t afraid to be an adversarial voice when it was necessary to improve West Michigan for our residents. Stephanie Kerr-Cathey is best known for her work in foster care, as a former board member of Big Brothers Big Sisters of the Lakeshore, Girls on the Run, the Muskegon Polar Plunge, the Committee for Jail and Juvenile Transition Center, Noah’s Project, the Salvation Army, the United Way, and most famously with Kids Food Basket where she is the Program manager for Muskegon County. Stephanie is tasked with day-to-day management, donor relations, budgets, volunteer engagement, community outreach, and relationship with the schools where the meals are delivered. She is busy with friend-raising throughout Muskegon County to make the program a reality and secure the funding. Also on the Board of Directors for Hackley Community Care – in her spare time – Stephanie has served tirelessly there for eight years. She is an avid supporter and voice for those who are uninsured or under-insured. She has also worked for a number of years in the foster care world, ensuring that women and children have access to health care and addressing childhood hunger at the local level. Women of Accomplishment is in its 23rd year of honoring local women for the work that they do – often behind the scenes and usually unsung – that change our community for the better. 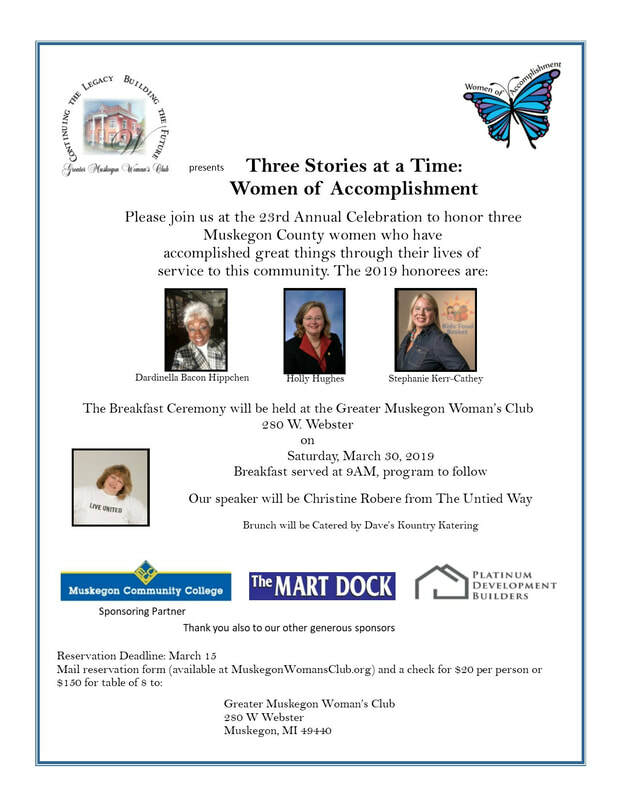 This year’s program will be held as a brunch on March 30 at 9AM at the Greater Muskegon Woman’s Club. The judges have met and out of the pool of nominees, selected the three honorees for this year, Dardinella Bacon Hippchen, Holly Hughes, and Stephanie Kerr-Cathey. If you would like to join us in celebrating these women, contact Nancy Bierenga at Nancy@HousesByNancy.com or by phone at 231.730.0887 for a reservation. All reservations are due by March 15. Letter from the Committee Chair. The Women of Accomplishment Program and Awards Breakfast began in 1997. This was modeled after the Concerned Black Women's Round-table Breakfasts held in the early 1990s. The goals of the new awards were to celebrate women who had given of their time, talents and treasures unselfishly; to acknowledge the important mentoring roles of women who swerved; to recognize those who we considered "unsung" heroines; and to increase the self confidence of women. The first breakfast was held in 1997. Since that year, more than 80 women have been honored from the nearly 400 nominations submitted. These nominations come from women all over Muskegon County. In 2009, the GMWC opened the Muskegon County Women of Achievement Hall of Fame in our Tea Room. This even coincided with the 30th anniversary of Women's History Month created by a bill signed by President Jimmy Carter to recognize and celebrate the historic accomplishments of women. Now all of the names of the Women of Accomplishment honorees, as well as their contributions to the community, will be remembered and displayed permanently.